This year I have partnered with Brothers in Christ Ministries and L & B's Pizzeria of Dale City to help them with their Annual SANTA TOY RUN. This yearly charity event is a TOY DRIVE for local kids who would otherwise go without a Christmas. Over the last 5 years, Brothers in Christ Ministries and L & B's Pizzeria have found a way to perfect this into an afternoon of live bands, raffles and a real kick off to The Reason For The Season. Last year, Brothers in Christ Ministries and L & B's Pizzeria's Toy Drive, gave a Christmas to 37 families for a total of 110 CHILDREN! With the money they raised from the 2014 Santa Toy Run they purchased 17 bicycles, shoes, pants and shirts for each child plus with all the toys donated they were able to give 4-5 presents to each child. There will be a Raffle and Live Bands ALL DAY! 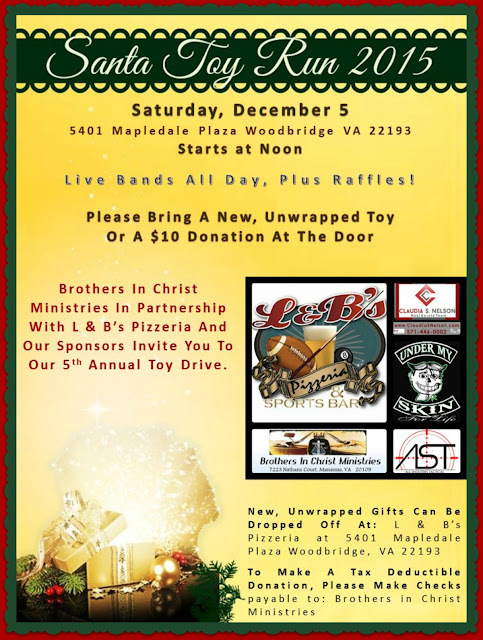 You can drop off a new, unwrapped toy at: L & B's Pizzeria located at 5401 Mapledale Plaza, Woodbridge Virginia 22193 To Make A Tax Deductible Donation, Please Make Checks Payable to: Brothers in Christ Ministries, please make sure you leave a return address with the check so they are able to mail you a receipt as soon as possible. There are so many people who help make this possible. Here is a short list of the current sponsors. Also, numerous bands who are donating their time for this great cause. As I get more information about the bands and the other sponsors, I will be sure to update you. SEE YOU SATURDAY, DECEMBER 5! 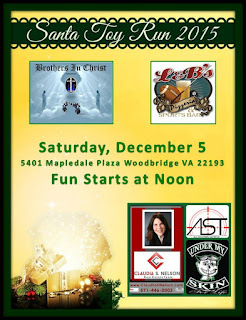 This entry was posted in fundraiser, Lake Ridge Woodbridge VA, toy drive, VA, Woodbridge VA and tagged 571-446-0002, Brothers in Christ Ministries, Claudia S. Nelson, L & B's pizzeria Dale City, Santa Toy Run Sponsor, Woodbridge VA Christmas Toy Drive, Woodbridge VA Santa Toy Run, www.ClaudiaSNelson.com by claudianelson. Bookmark the permalink.